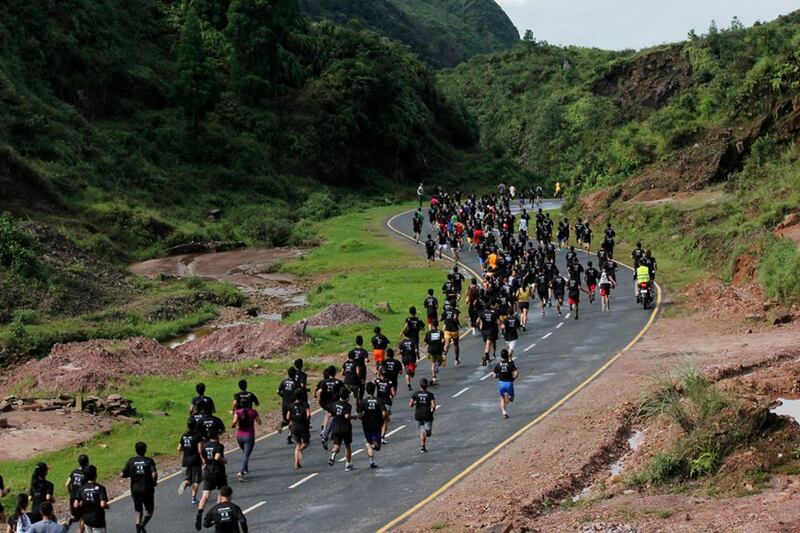 Around 800 enthusiastic participants took part in the Rotary Sohra Marathon in Cherrapunjee or Sohra, once the wettest place on earth, in Meghalaya on Saturday. Meghalaya Legislative Assembly Speaker, Donkupar Roy, flagged off the Rotary Sohra Marathon at 7:05 am by firing in the air from a ceremonial rifle. The participants were of all ages and hues. The age range of participants was from 7 to 71 years. There were four international participants including two each from Kenya and Ethopia at the Rotary Sohra Marathon. The first prize in the open category was bagged by a local boy, Tlanding Wahlang from Mawkyrwat while the second prize went to Ding Moo, from Aunachal Pradesh and the third prize went to Ainew Meconnen from Ethopia. The Marathon was meticulously planned with 17 water stations – one water station at every two km on the incline and 2.5 km in other areas. The run started with cheerleaders with their pom-poms encouraging the runners and there was a wonderful presentation of dances of the all the north-eastern states. A lucky draw was also organized on the occasion where there were prizes like a Marauti Celerio and Baja Pulsar bike.